SINGAPORE - Having lived near Balestier for much of his youth, retiree Jerry Low, 65, thought he knew the area like the back of his hand. But he was still surprised to learn that the elaborately designed Sim Kwong Ho shophouses along Balestier Road used to be owned by a Peranakan lady - hence the intricate Peranakan motifs on the shopfront. "I was shocked; I've seen it for such a long time but I never knew the owner was a Nyonya," said Mr Low. "It was something very new to me, I used to go to Ruby Theatre every two weeks but I never realised it." The now defunct theatre sat right opposite the row of shophouses then, he said. He found this out while training to be a senior ambassador for Reminiscence Walks, a new heritage tour programme for seniors by the National Heritage Board (NHB) and Sage Counselling Centre. Today, Mr Low is one of 10 trained senior ambassadors who are in charge of bringing their fellow senior citizens along a monthly guided tour in Balestier. The tours were officially launched on Tuesday (Dec 18), with the first batch of seniors going on a tour around historic sites and traditional businesses in Balestier, as led by Mr Low and his fellow guides. The monthly tours are four hours each, and about 20 seniors take part in every round. Apart from Balestier, tours will be rolled out next year in Kampong Glam and Little India. The programme aims to help reduce the social isolation of the seniors-at-risk, and allow seniors to help their fellow senior citizens by being guides, said Mr Alvin Tan, NHB's assistant chief executive of policy and community. The places were chosen specifically to appeal to the senses of senior citizens with the aim of triggering old memories and enhancing their mental agility, said Mr Tan. "We wanted to bring participants out to explore the precinct and reacquaint them with everyday heritage," said Mr Tan. 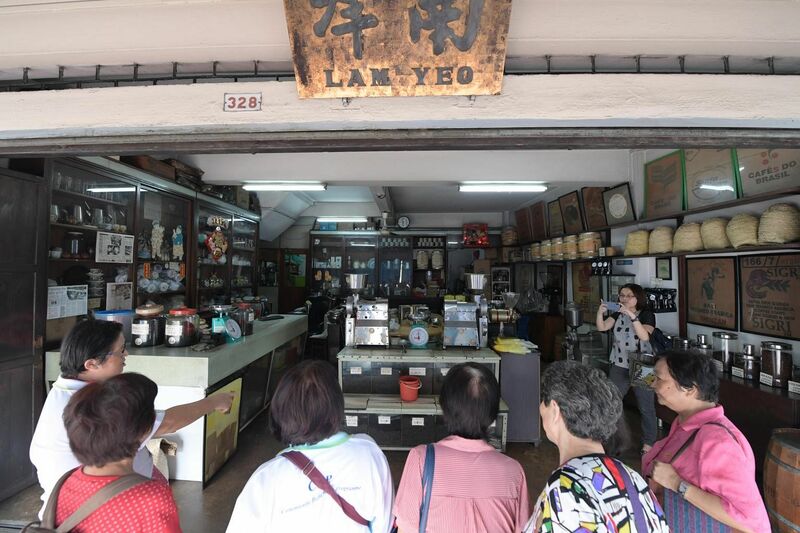 For example, as part of the Balestier tours, senior citizens set off from the Sun Yat Sen Nanyang Memorial Hall in groups of 10, to tour the intricately designed Sim Kwong Ho shophouses. Along the way they will drop by Lam Yeo Coffee Powder, a traditional coffee grinder, and old-fashioned bakery Sweetlands Confectionery and Bakery. 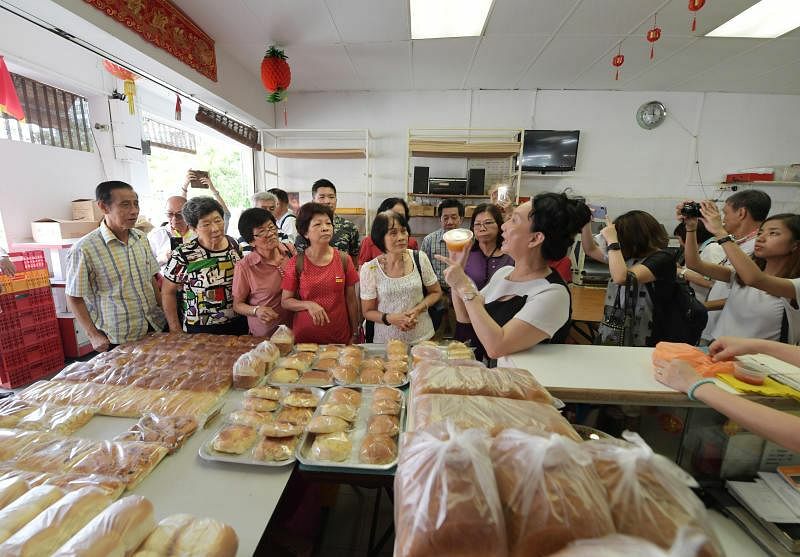 Participant Koh Kee Seng, 70, a retired policeman who took part in Tuesday's tour, said it was interesting to be able to see how bread was made the old-fashioned way inside the bakery. "It's a journey of remembrance," said Mr Koh. Triggering such old memories could help to slow down the onset of early dementia, said Ms Shannen Ang, centre manager and senior counsellor of Sage Counselling Centre. Many of the participants shared their old memories during the walks and enjoyed the trip down memory lane, said Mr Jerry Low. Some had even asked for it to be a weekly feature, he added. "When I hear this, it brings me joy to know that that I can bring a little bit of happiness to them."